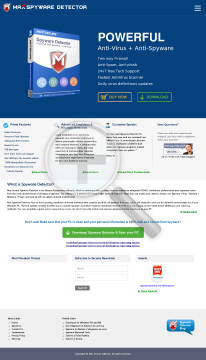 Spyware Detector is a complete solution for individuals, professionals and home users. The software is specially designed to scan, detect, delete and recover spywares with an option of quick and full scan. Spyware Detector is a complete solution for individuals, professionals and home users. The software is specially designed to scan, detect, delete and recover malwares, adwares, spywares and trojans with an option of quick and full scan. This software is also powered by some advanced features like, Block Active X, Block Cookies, Block BHOs, Registry back up, Live Monitoring for IE home page hijacking, system and win ini file change monitor, monitor registry changes, tracking cookies monitoring and Process monitoring. The software has a complete database of the most commonly and largely found threats, which are detected and can be deleted immediately. Our live update module will enable our users to update their database frequently.